We’ve just completed our first week of the new season and the atmosphere at the Bell Ringer has been anything but dull! 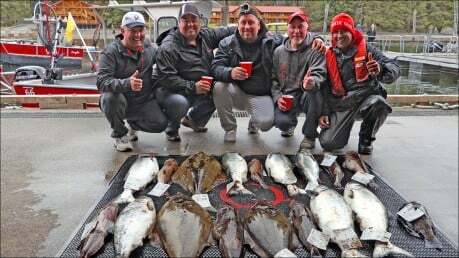 From slinky lingcod to silver tails, many guests are arriving at the dock with a fish box full of oceanic goodies! Guests are being selective about the salmon they bring in, choosing to keep Chinook averaging 10-12 lbs, as well as a great variety of bottom-dwelling creatures including rockfish and some medium-sized halibut. A great 6-pound Black Rockfish (Bomber) arrived at the dock yesterday – stay tuned to find out why this is an amazing catch! Guests come to QCL because they want to fish, but the excitement doesn’t end when the fishing day is done! Bell Ringer chef Brad has been sizzling up some crispy appetizers for the onrush of arriving guests, who can be seen with a cold drink in hand, swapping fish stories (let’s be honest – we’ve all caught the biggest salmon in Haida Gwaii), and relaxing after a full day’s work. From the comfort of the heated patio, guests have been enjoying the scenic views of the harbour and its many inhabitants – mainly otters, seals, and eagles! The Red Boot Team has been full of energy this week, excited to start the season off well and working hard to accommodate all guests’ personal and fishing needs! Have you tried Candied Salmon? Sablefish? Ask a Red Boot Team member (that’s me!) about how you can try Haida Gwaii seafood with “A Taste of B-Sea” – you’ve never had Albacore tuna this fresh! There’s no doubt that the Bell Ringer has got all of your “apres peche” (after fishing) excitement and amenities, come and check out the fishiest Bar in Haida Gwaii for yourself! We can’t wait to see you here!